Genre: Contemporary romance, Christian fiction. Length: 11 hrs, 4 minutes. Unabridged. With their past tearing them apart, it will take a storm to bring them together . . . Billionaire Ian Shaw can have everything he wants–except a happy ending. Or at least that’s what it feels like with his fortune recently liquidated, his niece missing, and the woman he loves refusing to speak to him. Despite her love for Ian, Sierra Rose knows he has no room in his life for her as long as the mystery of his missing niece goes unsolved. Sierra has solved it, but a promise to the girl to keep her whereabouts secret has made it impossible to be around Ian. When Sierra needs funds to repair the damaged PEAK chopper, Ian offers a fundraising junket for large donors on his yacht in the Caribbean. But the leisurely excursion turns into a nightmare when a rogue wave cripples the yacht and Ian and Sierra find themselves washed up on a strange, empty shore. It will take guts for the PEAK team to rescue the duo. But it will take a miracle to rescue Ian and Sierra’s relationship. I’ve been eagerly awaiting this story ever since I first started reading the Montana Rescue series with Wild Montana Skies and If Ever I Would Leave You. The first book and prequel to the series introduced Ian and Sierra, among other characters, and that’s when I first fell for their story. Then, their story continued on the back burner through books 2 and 3. An agonizing wait! But now, in book 4, we get to see their relationship develop more fully. Their characters are well developed over the course of this book with faith journeys and character development centering on issues of control vs trust. Pete and Jess also see their relationship develop further over the course of this book as well. Readers who enjoy action, adventure, and romance will find much to love throughout this series. And those already familiar with the series, can look forward to a short-term change of setting with action and adventure on the high seas this time around. Highly recommended. I’ve listened to several of the titles in this series in audio format, including this one, and enjoyed them greatly. Cynthia Farrell’s reading is consistently excellent from one book to another. Accents, vocal inflections, pacing, and emotional delivery all contribute to the overall effect, and I appreciate the consistency in the way the characters are portrayed from one book to another. I borrowed this audiobook from my local library. I was not expected to write a review, but wanted to share how much I enjoyed the book. Length: 10 hours, 22 minutes. Unabridged. It’s those we love who have the power to hurt us most . . .
Champion backcountry snowboarder Gage Watson has left the limelight behind after the death of one of his fans. After being sued for negligence and stripped of his sponsorships, he’s remade his life as a ski patrol in Montana’s rugged mountains, as well as serving on the PEAK Rescue team. But he can’t seem to find his footing–or forget the woman who betrayed him. Senator and former attorney Ella Blair spends much of her time in the public eye as one of the youngest senators in the country. But she has a secret–one that cost Gage his career. More than anything, she wants to atone for her betrayal of him in the courtroom and find a way to help him put his career back on track. When Ella’s brother goes missing on one of Glacier National Park’s most dangerous peaks, Gage and his team are called in for the rescue. But Gage isn’t so sure he wants to help the woman who destroyed his life. More, when she insists on joining the search, he’ll have to keep her safe while finding her reckless brother–a recipe for disaster when a snowstorm hits the mountain. This is Book 3 in the Montana Rescue series, a series which I’m enjoying a great deal. I particularly love how each book gives backstory and layered dimension, not just to the hero and heroine of that story, but also to secondary characters who will be making more prominent appearances in future stories. For this reason, this is definitely a series you’ll want to read in order, even if you could probably read any individual title as a standalone without confusion. Check out my review of Wild Montana Skies and its prequel novella If Ever I Would Leave You for a starting point. In A Matter of Trust, Ella and Gage have a past history that makes them seem unlikely candidates for romance. And yet, the development and progression of their relationship as they work together in a dangerous and difficult situation, feels quite natural. And the lessons about trust they learn and apply to their lives in the process give their story deeper meaning than just a fun romance. Speaking of fun… the snowboarding theme is fun too. I haven’t been skiing in years, and have never been snowboarding, but I enjoyed the vivid and scenic descriptions throughout Ella and Gage’s adventure. Meanwhile, Ty meets Brette, Pete and Jess have some misunderstandings cleared up and secrets revealed, and Ian and Sierra share some important story moments. Precursors of things to come? Let’s just say I can’t wait for the next amazing read in this series. I enjoyed Cynthia Farrell’s narration in Rescue Me (Book 2 of this series), so I was happy to hear more from this narrator in this title. The character voices and accents are excellent, and the story is told with feeling. The pacing and enunciation is also well done. I’m looking forward to another excellent performance in Troubled Waters the next audiobook in this series. Length: 11 hours, 37 minutes. Unabridged. After falling as hard as I did for Ben, Kacey, Ian, and Sierra in Wild Montana Skies, I was a little skeptical whether I would feel quite the same way about Sam and Willow in this next book in the series. I needn’t have worried. Sam and Willow did a fabulous job of stepping into the roles of hero and heroine, and sweeping me away into their story. They’re both complex and likeable characters with a lot to lose, and a lot to learn over the course of an unexpectedly intense wilderness adventure. Meanwhile, the author wove in bits and pieces of other characters’ stories, building on the intricate tapestry already begun in the first book of this series. We get to know Ian, Sierra, Pete, Jess, and other characters better, even as we follow Sam and Willow to a well-deserved happily ever after. I highly recommend this series, and I can’t wait to read the next book, and the next. The performance by Cynthia Farrell is excellent. Her reading is emotionally expressive, with varied voices for the different characters. Most impressive was that she sang several of the country western songs that appeared in the story, and sang them well. Bonus points for going above and beyond the call of duty on that front! I recommend this audiobook to the audio listeners out there. I hope to continue listening to the audio editions of future titles in this series, particularly if they’ll be read by the same narrator. Next up: A Matter of Trust. And yes, I’ve already tracked down the audio edition. I borrowed this audiobook from my local library, and was not expected to write a review, but I wanted to share how much I enjoyed the book. The last thing Search and Rescue helicopter pilot Kacey Fairing needs upon returning home to Mercy Falls, Montana, is to run into her mistakes. After a devastating crash during her recent military tour in Afghanistan, she is emotionally broken but ready to start putting her life back together. She just wants to reconnect with her teenage daughter and spend the summer working as the new lead pilot of PEAK Rescue in Glacier National Park. But her mistakes aren’t so easily forgotten. Because Ben King is also back in town. Country music star Ben King abandoned his past when he moved to Nashville thirteen years ago to start his career. He hoped to heal his broken heart, caused by losing the woman he loved. But when his father is injured, Ben is called home to help manage PEAK Rescue during his recovery. He doesn’t realize his father has ulterior motives until his old flame, Kacey, walks into his house and back into his heart. Now, with Mercy Falls in a state of emergency due to flash floods, Kacey and Ben will have to work together to save lives. But when secrets are uncovered and old hurts rise to the surface, will they walk away again? Or can they find a different ending to their country love song? I’ve had the pleasure of meeting this author in person and hearing her speak at a Christian fiction writer’s conference, and I’ve been reading a nonfiction book she’s written about fiction writing called The Story Equation. And finally, now I can say I have read one of her novels. And found that, yes, it lived up to what I’d been hoping it would be. So you can imagine I’ll be playing some serious catch-up to make up for lost time in reading her other books, particularly the others already published in this series. Next up, Rescue Me. But I’m getting ahead of myself. First, about this book. The people and relationships have a depth and emotional resonance that’s a hallmark of good fiction. The kind of story you can get lost in for hours at a time. The setting sounds lovely, and the community welcoming, the kind of place I’d want to visit in real life… preferably not during flooding or other natural disasters though, if I can help it. Ben and Kacey make great leads for this story. They each have their own issues and complicated backstories, but they’re clearly better together. It was fun to watch them working through it all and toward their happy ending. The secondary characters are intriguing as well, with unexpected depth. Some of my favorite scenes involved Sierra and Ian’s relationship. I’m very much looking forward to reading more about these and other secondary characters within the PEAK Search and Rescue Team in other books in this series. In fact, when I read this book, I didn’t realize there was a novella preceding it in the series that’s about Ian and Sierra, earlier in their relationship. I went back and read that one immediately. So good! And it fleshes out the backstory for Ian and Sierra beyond what you get in this novel. So I’d recommend reading that novella, called If Ever I Would Leave You, first thing and then immediately diving into Wild Montana Skies and the rest of the series. Thank you to the publisher for providing the complimentary copy of Wild Montana Skies that I won in a Goodreads First Reads Giveaway! Reading and reviewing it has been a joy. With Thanksgiving right around the corner, my thoughts are turning to turkey and gravy, and family, and stuffing, and mashed potatoes… and some of the things I’m thankful for… and pumpkin pie. In no particular order. 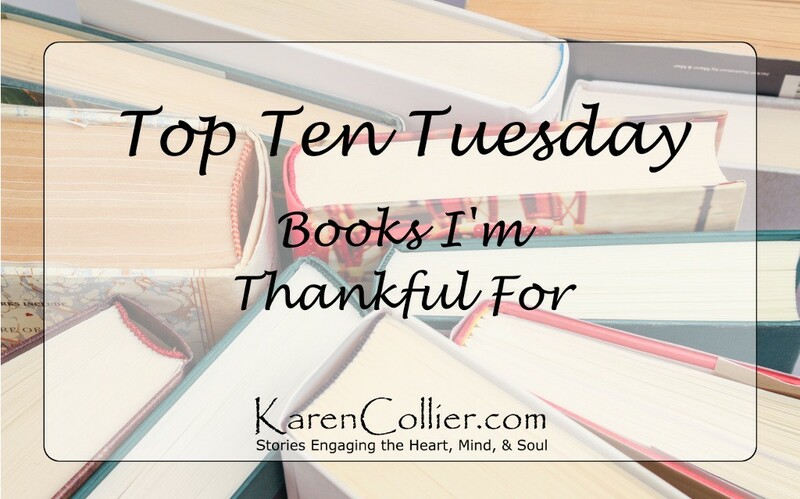 And, since this week’s Top 10 Tuesday topic at The Broke and the Bookish is “Top Ten Books I’m Thankful For,” that’s what I’ve decided to blog about. I’d love to hear what books you’re thankful for too. The Bible. If you know my reading habits and my beliefs, this one kind of goes without saying, but I’m going to say it anyway. No other book can ever be as life changing or important to me as this one. The overarching story of the Bible is a beautiful tale of God’s love for mankind and his plan of grace and redemption. It amazes me how, after reading it for years, I still glean something new with each reading. The Butterfly and the Violin by Kristy Cambron. I won an autographed copy of this novel in a Goodreads giveaway. And reading it introduced me to an author who quickly became one of my favorites. Then I got to meet her in person at a writing conference and discovered what a sweet and thoughtful person she is. The book itself is both meaningful and beautifully written, and I highly recommend reading it. The Chronicles of Narnia by C.S. Lewis. The summer between second and third grade, the children’s librarian at my local library recommended I read The Lion, the Witch, and the Wardrobe. I loved it so much then, and I love it (and the rest of the titles in the series) even more now that I can better appreciate its allegorical elements. The Best Yes: Making Wise Decisions in the Midst of Endless Demands by Lysa TerKeurst. This inspirational nonfiction book reassured me that letting go of busywork is okay, even a good thing, when it makes room for more meaningful activities. It sounds kind of obvious, but it was something I really needed to hear at the time, and still do every now and then. The Elephant and Piggie series by Mo Willems. I first heard of this series in a Library conference session where the speaker discussed fun book related activities to do with kids, such as using elephant and pig masks or puppets along with these books. My kids and I love the humor and the fun of reading and acting out these characters’ antics. In fact, these books have played a part in some of our family’s most enjoyable reading experiences. The Haven Seekers Series by Amanda G. Stevens. This series exemplifies what I would like to see more of in Christian fiction. A thought provoking premise, realistically flawed characters, and Christian themes that are neither preachy nor superficial. You’ll want to start reading with Seek and Hide, the first title in the series, but I think it’s the fourth and final one that’s my favorite, called Far and Near. The Story Equation by Susan May Warren. Susie and fellow author Rachel Hauck presented and demonstrated the story building concepts from this book at a writing conference I attended before this book had become a book. I was fascinated by what I heard, but had to miss half their talk in order to keep my appointment to pitch my novel to an agent. So you can imagine I was thrilled to find this book a few years later and fill in the missing pieces. I’m in the midst of reading it now, and already planning to read it through again. A Broken Kind of Beautiful by Katie Ganshert and Not in the Heart by Chris Fabry. These were the books that first introduced me to two of my favorite authors. Both use beautiful language to tell the kind of meaty and discussable story that I find fascinating, and that can be perfect for a book discussion group. To Win Her Heart by Karen Witemeyer. This book holds a special place in my heart because the heroine is a librarian like me, and the hero is a blacksmith like my husband. It was also my first taste of this author’s humorous writing style. It’s been way too long since I’ve read this one though, so I’m thinking I may need to revisit these characters again soon. So those are a few of the titles that came to mind, when thinking of books I’m thankful for. Which books would you put on your list?